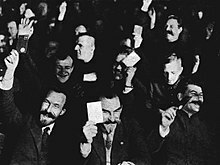 The 15th Party Congress; in the foreground Alexei Rykov, Mykola Skrypnyk and Joseph Stalin raising their membership cards. The Central Committee (CC) composition was elected by the 15th Congress, and sat from 19 December 1927 until 13 July 1930. The CC 1st Plenary Session renewed the composition of the Politburo, Secretariat and the Organizational Bureau (OB) of the All-Union Communist Party (Bolsheviks). ♀ Indicates that the individual is female. CPB, CSC, COB The first "C" in these initials refers to "Candidate member"
The CC was not a permanent institution. It convened plenary sessions, of which six CC plenary sessions and two joint CC–Central Control Commission (CCC) plenary sessions were held between the 15th Congress and the 16th Congress. When the CC was not in session, decision-making powers were transferred to inner bodies of the CC itself; the Politburo, Secretariat and Orgburo (none of these bodies were permanent either, but convened several times a months). Individuals employed by Central Committee's bureaus, departments and newspapers made up the apparatus between the 15th Congress and the 16th Congress. The bureaus and departments were supervised by the Secretariat, and each secretary (member of the Secretariat) supervised a specific department. The leaders of departments were officially referred to as Heads, while the titles of bureau leaders varied between chairman, first secretary and secretary. ^ Vyacheslav Menzhinsky's father was Polish. ^ Vasily Schmidt was born into a German family, but was born and raised in Russia. ^ Konstantin Gey was born into an Estonian family, but was born and raised in Russia. ^ Valery Mezhlauk's mother was German. Staff writer. "Съезды, конференции, пленумы и заседания РСДРП – РСДРП(б) – РКП(б) – ВКП(б) – КПСС" [Congresses, conferences, plenary meetings and meetings of the RSDLP – RSDLP (b) – RCP (b) – AUCP (b) – CPSU] (in Russian). knowbysight.info. Retrieved 22 August 2015. Staff writer. "Персональный состав Центрального комитета РСДРП – РСДРП(б) – РКП(б) – ВКП(б) – КПСС" [Membership of the Central Committee of the RSDLP – RSDLP (b) – RCP (b) – AUCP (b) – CPSU] (in Russian). knowbysight.info. Retrieved 22 August 2015. Staff writer. "Центральный Комитет, избранный XV-м съездом ВКП(б) 19.12.1927, члены" [The Central Committee elected by the XV th Congress of the CPSU (b) 12.19.1927 members] (in Russian). knowbysight.info. Retrieved 22 August 2015. Staff writer (19 June 2008). "ЕВРЕИ И ВЛАСТЬ В РОССИИ (1917-1924 гг.)" [Jews and Power in Russia (1917–1924 biennum)] (in Russian). LDN - приватное собрание книг. Retrieved 22 August 2015. Staff writer. "Узкий состав ЦК РСДРП(б) – Политическое бюро ЦК РСДРП(б)—Бюро ЦК РСДРП(б) – РКП(б)—Политическое бюро ЦК РКП(б) – ВКП(б)—Президиум – Политическое бюро ЦК КПСС" [The narrow composition of the RSDLP (b)—Political Bureau of the Central Committee of the RSDLP (B)—The Bureau of the Central Committee of the RSDLP (b) – RCP (B)—Political Bureau of the Central Committee of the RCP (b) – AUCP (b)—the Presidium – Political Bureau of the Central Committee of the CPSU] (in Russian). Retrieved 21 June 2015. Staff writer. "Секретариат ЦК РСДРП - РКП(б) - ВКП(б) - КПСС" [Secretariat of the Central Committee of the RSDLP (b) – RCP (b) – AUCP (b) – CPSU] (in Russian). Retrieved 21 June 2015. Staff writer. "Организационное бюро РКП(б) - ВКП(б)" [Organizational Bureau of the RCP (b) – AUCP (b)] (in Russian). Retrieved 21 June 2015. Fainsod, Merle; Hough, Jerry F. (1979). How the Soviet Union is Governed. Harvard University Press. ISBN 9780674410305. Communist Party of the Soviet Union (1984). "Chapter 3: Statute of the Communist Party of the Soviet Union". In Simons, Williams; White, Stephens (eds.). The Party Statutes of the Communist World. Law in Eastern Europe. Brill Publishers. pp. 413–435. ISBN 9024729750. ^ Simons & White 1984, pp. 423–425. ^ Fainsod & Hough 1979, p. 410. ^ Fainsod & Hough 1979, pp. 410–411 & 417–419. ^ Fainsod & Hough 1979, pp. 417–419. This page was last edited on 21 April 2019, at 12:12 (UTC).